With multiple endorsements on Stack Exchange, Restore Gene is a simple two-script framework, one T-SQL and one PowerShell for optimising SQL database restores. They can be used to automate a variety of restore tasks, such as a full recovery, a restore to a point in time, or stepping through a recovery sequence in STANDBY mode using different STOPAT times. It will also generate the DBCC CHECKDB command to execute against the restored database, the scripts can help to initialize database mirroring, replication and availability groups, multiple standby server databases can be restored concurrently using simultaneous invocations. The stored procedure generates the required restore scripts and is a useful tool by itself; in disaster recovery situations, it can construct a restore script to a given point in time in seconds. Running it without any parameters generates a restore script for all user databases on an instance to the most recent point in time. 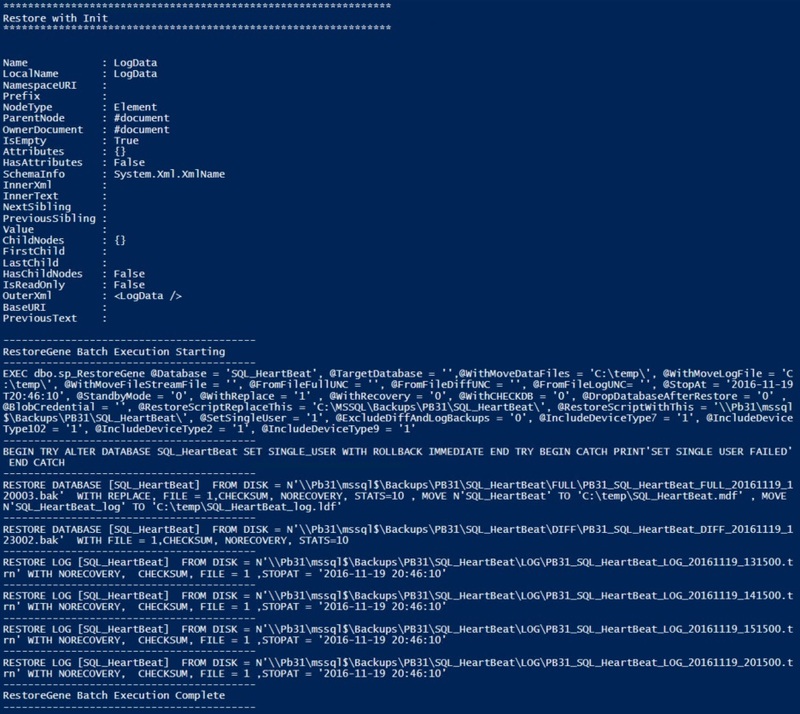 The companion PowerShell driver script is to automate the database restore process. It calls the stored procedure on the primary to generate the required restore script which it then executes on a standby server. The PoSh script can only process one database at a time, database name is a required parameter, but it can be called multiple times simultaneously for different standby databases. No changes should be necessary to either the PoSh script or the Stored Procedure. Just create them then call them passing parameters to suit your purpose. The T-SQL script can be invoked from query analyser, copy the TSQL column in the procedures results then paste and run. The PoSh drive script can be invoked from a SQL Agent job step or any PoSh shell. Brent Ozar ULTD – Generated a lot of interest and suggestions. Many other people have contributed, offered encouragement and feedback over the years, much appreciated. Double click to highlight the entire script, copy and paste. There are a lot of comments under each link which server as FAQ documentation. The backup jobs and this user guide were left running and were written over the course of a few days. The simplest way to start using Restore Gene is to call it without parameters from a Query Analyser command line. This will return a restore script for all user databases to the most recent point in time possible using the appropriate full, differential and log backups. If CHECKSUM was specified in the backup command it will be used in the restore command too, the database will be left in NO RECOVERY state, see the full parameter list for all the default settings. The restore script created by this call to Restore Gene will not execute as the most recent backup was not a tail of the log. The WITH REPLACE parameter was not supplied and the default is no so the restore command would generate an error when executed and fail. If no tail of the log backup was taken, use the WITH REPLACE parameter, in the example below the databases are recovered after the restore then CHECKDB is run. To recover a specific database to a specific point in time, supply restore gene with the parameters shown below. In this example Restore Gene was run on November 19th restoring to a time on November 18th. And at 15:30, a restore is run with Stop At 13:30 then subsequently another Log Backup is taken at 16:00. There’s potentially an issue with Restore Gene constructing restore script WITH MOVE statements from sys.master_files, if a database file exists when restore gene runs but did not exist when the backup was taken then the restore script does not reflect the database files at the point the backup was taken. If the @SuppressWithMoves parameter setting is the default ON and there are won’t be any problems with the restore scripts, if the parameter is switched off then potentially the restore execution will fail. This will only be an issue if additional database files are added after the backup and parameter @SuppressWithMoves = 0. There are five optional parameters relating to WITH MOVE statements, 2 for display purposes and 3 to override the target folders when restoring data, log and file stream files. The SQL_Hekaton_HeartBeat database used in the examples below contains a secondary data file and a file stream data file, the first example displays the existing file details and the second example moves the files. If the restore script created on the primary server is intended for execution on a standby server the FROM FILE parameters will replace the backup folder path with a new path which could be a UNC share. The example below creates a restore script that can be run on the standby, the \\pb31\MSSQL$\Backups\ path is a hidden share on the primary accessible from the standby server. If a backup is taken to Azure blob storage (URL) then restore gene will detect it and incorporate FROM URL in the restore script it generates. The same credentials used for the backup can be passed as a parameter to restore gene and this information is then included in the restore script constructed. All parameters are optional and have a default value. @Database NULL Restore a specific database or a list of comma seperated database names, defaults to NULL which restores all user databases. @TargetDatabase NULL Override restored database name, only possible if working with a specific database, defaults to NULL, if supplied will rename files to avoid clash if restoring to same server without WITH MOVE. 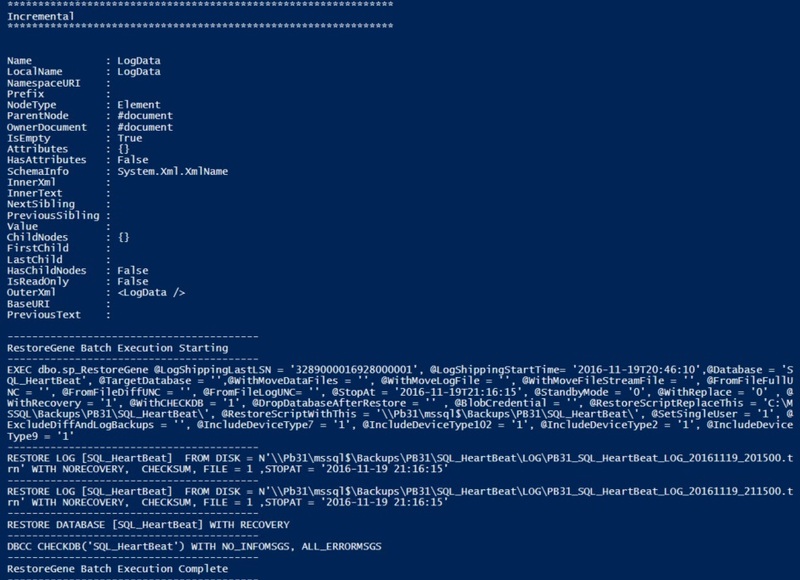 The PowerShell script calls sp_RestoreGene on the Primary Server and executes the restore script it constructs on the Standby Server. The -LogShippingInitialize parameter default setting is True. True – Identify and the required full, differential and log backups from the primary server and execute the restore script on the Standby Server. False – Identify new log backups with a higher LSN than last full/differential/log backups used during initialization. The example call below restores database ‘SQL_HeartBeat’ to a standby server with initialization. The screenshot below shows the commands executes by ps_RestoreGene as a result of the above call. The screenshot below shows a second call made to ps_RestoreGene with initialization set to no, the call was made after new log backup was taken on the primary. The screenshot below shows the commands executes by ps_RestoreGene as a result of the above call, just the new log backup is restored followed by With Recovery and CHECKDB. 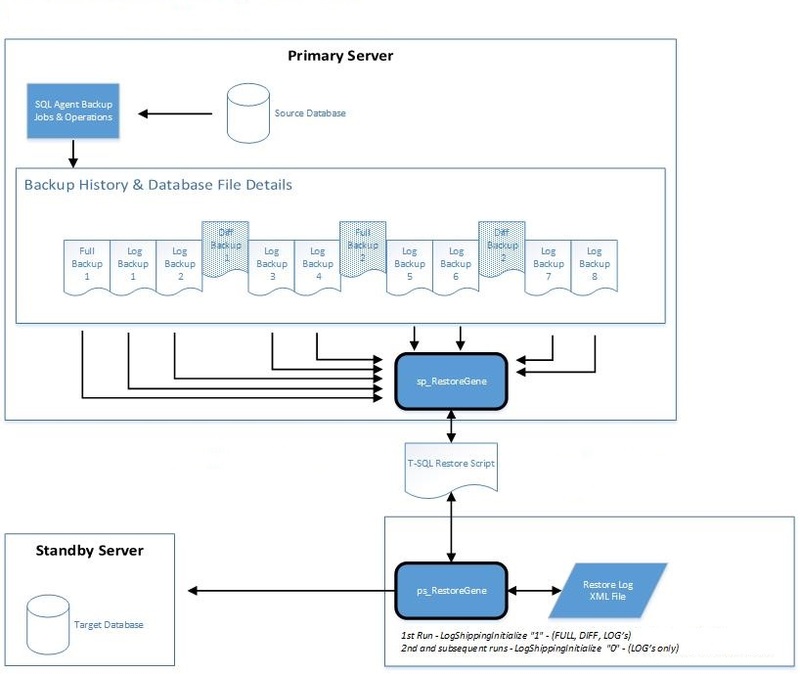 The diagram below illustrates the process flow, backups on the primary, ps_RestoreGene executes sp_RestoreGene on the primary and executes the restore scripts on the standby. Restore Log, Primary Server, Standby Server and Database Name are mandatory, all other parameters are optional and have a default value shown in the table below. -FromFileFullUNC NULL Shared folder containing full backups, required different primary and standby servers are specified. If path name contains a $ then a PowerShell break character is required. -FromFileDiffUNC NULL Shared folder containing differential backups, required different primary and standby servers are specified. If path name contains a $ then a PowerShell break character is required. -FromFileLogUNC NULL Shared folder containing log backups, required different primary and standby servers are specified. If path name contains a $ then a PowerShell break character is required. Supports a maximum of 15 stripped backup files. Is not compatible with SQL Server 2000 and lower versions. A single backup fork point LSN is supported. There are considerations using the WITH MOVE override parameters, when database files have changed since the backup was taken specifically. If the backed up databases contain multiple files in different folders, and the standby server folder structure differs, the @WithMove parameters offer only one target folder for each type (data, log, file stream). SQL Server Restore Gene is licensed under the MIT license, a popular and widely used open source license. 1. Would it be possible for sp_restoregene to work on something like a “file/folder” mode? this is, prepare the list of backups out of files instead of basing the whole work from msdb.dbo.backupset? I think that would be a terrific addition. I’m imagining a situation where you may want to use restore gene for your disaster recovery plan (if a server goes down) and since you have lost your server you have no access to the msdb database either so restore gene is automatically not an option anymore. I guess you could argue that you should also backup your system DBs as a best practice (and msdb included) but again, the recovery process would involve using a standard T-SQL RESTORE DATABASE for msdb and only then use restore gene for the rest, which makes it a bit less straightforward. Having said that, even with the msdb.dbo.backupset pre-requisite. sp_restoregene rocks! 2. I have noticed (I don’t know if you have seen it too) that Brent Ozar has released their own “DatabaseRestore” stored proc as part of the “SQL Server Download Pack from Brent Ozar Unlimited”. Have you used it? are you familiar with pros/cons of that sp vs. sp_restoregene? Thanks again for all the work and for providing this fantastic stored procedure under the MIT license and making it available to the SQL Server community. I’m pretty sure I speak for many when I said we really appreciate that! Thanks very much for the feedback, it’s great to hear the procedure is proving useful, it took ages to develop. If you run sp_RestoreGene as a SQL Agent Job step after the backup job step, to create a restore script for the database(s) just backed up, set the Restore Gene parameters to restore to the most recent point in time, set the SQL Agent job step advanced properties to output to a file in the backup folder, with overwrite. Then you always have a restore script ready if the server crashes. Thanks Paul, your idea about integrating the backup/restore activity via SQL Agent Jobs sounds interesting. I’m going to explore the possibility of using that one too. And I totally agree, an automation process such as this for such a sensitive task as Restoring a database MUST be bullet-proof. One of the reasons I like your solution, as you say, is it has been battle tested and many people have used it in the past. I’m all good with early adopters, but when it comes to disaster recovery and production environments I suddenly become a very conservative guy… hehehe. Again, thanks for all you do with RG. BTW. Is there a way to receive a notification if a new version of this SP is released? I would love to be notified (as opposed to checking this page from time to time… which I can entirely forget!). If you subscribe to my blog you should get an update in future when new posts are created. Whenever a new version of Restore Gene is released I will post a new blog with details. Updates are fairly infrequent now, they are typically made when bugs are spotted and, touch wood, its been quiet for a while now. Is it possible to have the results saved to an UNC path directly after a backup or emailed? I´m using managed backup on SQL2014 to backup to Azure Blob storage. Check out sp_ScheduleBackups which is part of the SQL Fairy Backup tools http://www.sqlfairy.com.au/downloads/ . The tools include a stored proc which will email a current DR restore script (generated by Restore Gene) to a specified address (will also configure SQL mail if necessary). The sp_ScheduleBackups stored proc will automagically generate and schedule Agent jobs to backup databases in a weekly full, daily diff and periodic transaction log (I recommend every 15 minutes) backup regime. A step is added to the generated backup jobs to email a current (post backup) DR restore script to a specified email address following each backup. This ensures that you’ll always have a current DR restore script at hand should the worst happen and your MSDB database isn’t available. SQL Fairy Backup Tools also includes usp_RestoreDB to restore databases from one server to another (assuming a central backup location) and also usp_AutoMirror to automagically mirror databases between servers, all using the power of Paul’s brilliant RestreGene. Thanks Paul. If I run restore with move the script generates wrong path (using azure blob storage). MSSQL12_testperfdb. Is the issue that I haven´t changed default location? Could you try upgrading the procedure to the latest version 6.58, it looks like you are using an old version. then I’d expect that this database would be restored using your default directories. Try specifying the additional move parameters. The DECLARE @msg variable and RAISERROR code have been completely removed in V6.57, they were causing other issues and a few people complained about them so good bye to it all. There are 4 new parameters for different device types, all defaulted to ON (include), if you set @IncludeDeviceType7 = 0 it should meet your requirements. Thanks for the good suggestions and pointing out the bug. Paul, first off – thank you! I’ve been using this tool for years in its T-SQL form and it is wonderful. I owe you a meal, sir. Enhancement request – a bit parameter to exclude VDI backups (device_type = 7). Edge case bug report: If two databases have names that differ only between a hyphen and an underscore ( my_database and my-database ) there is a collision in the RAISERROR variable names in the generated T-SQL. Enhancement request – a bit parameter to disable RAISERROR variables/usage in the generated T-SQL. Great script, I love it. But I can’t find a parameter to set database in SINGLE_USER WITH ROLLBACK IMMEDIATE to restore over an online database. There’s a new parameter for your suggestion, it does make sense. I am curious one parameter if you can help me. Restore gene created a script for all backups like full,diff or log but i am only interested Full backup scripts by using parameter, is there any way i can use any parameter to get only full backup results. It won’t return just the full backups only at the moment unless the databases are using the simple recovery model. I can see how it would be useful in certain circumstances to do so though. It might not be available for a few weeks but I will add a new parameter for this in the next release. There is a new parameter to support your suggestion and suppress differential and log backups in the restore script. I really appropriate your help. It worked great.